Please get the snow out your head !!! It's so easy to blame people of a different background for your problems !!! My second week in minnesota and I have never been so proud to say I'm from California !!!! Minnesota shouldn't be a state it should be a planet !!! You people are so stupid, can't drive strange looking people I have ever met !! You read four different newspapers just to learn what the rest of the world is up to... Maybe you people all have one big permanent brain freeze from all your snow !!! If wasn't for all the wonderful culture in the twin cities who would come visit minnesota !!! News flash people every where else in the world people are laughing at you !!! I stop at fast food the other day this guy (white) gave me my food and I swear he looked like something from that movie men in black.. While you people are waiting for all the beautiful culture to leave. Maybe you people should find your space ship !!! 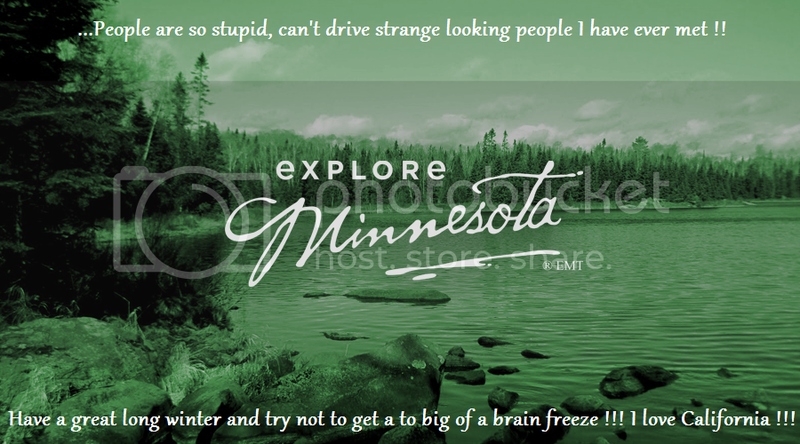 Have a great long winter and try not to get a to big of a brain freeze !!! I love California !!! I wanted to share a few site I found, that talks about your great state !!! You can see it's not just me. DO I SMELL A NEW TOURISM SLOGAN?!? I'll put it in the "maybe" pile. Implying i care what people around the world think of Minnesota? ok, that pic was hilarious. you win the internet for a day. Blah blah blah. In case you didn't know EVERY IMMIGRANT GROUP THAT HAS COME HERE has been persecuted and accused of being unloyal criminals, leeching off of the system. Guess what happens? In 2-3 generations they melt in to the society, their views become more moderate and for the most part they become productive members of society. The above went for the Irish, the Germans, the Chinese, the Japanese, the Italians and so forth. LOL @ the people claiming hispanic people are ruining small towns. If it wasn't for the brunt of their labor, you would either not have your farming products or have them at a much greater cost if farmers had to actually pay a living wage. I wonder exactly to what degree that is true for the Scandinavian immigrants to MN. I know that there was some derision regarding them being "dumb," an insistence that they speak English and perhaps in some parts of the state exclusion depending upon which established group was in the majority. I'm unsure how they could have been accused of "leeching off the system" because there was no system in place to help them other than the groups they formed on their own. Scandinavians were considered dumb laborers, not criminals. Aside from escaping the problems of their home countries, most were enticed by the prospect of free land under the Homestead Act. My point being to recognize that all immigrants cannot be lumped into the same category as PDXNative2Houston had done. The era, the political atmosphere, the culture and habits, and other factors all play a part in how they are received. ". . .EVERY IMMIGRANT GROUP THAT HAS COME HERE has been persecuted and accused of being unloyal criminals, leeching off the system."